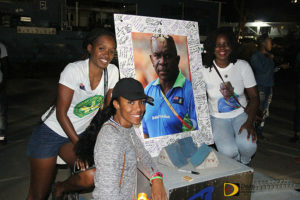 Before he was buried in the Johnson Ghut ceremony on Saturday afternoon, current and former athletes, parents, family, friends, supporters, well-wishers and fellow coaches, gave Coach Dag Samuels a 400m lap of honor during Friday night’s candlelight vigil held in his honor at the A. O. Shirley Grounds, where he managed and dedicated his life to the development of the territory’s track and field athletes. Led by the Royal Virgin Islands Police Force, scores of people gathered at his house in Huntums Ghut and marched to the A. O. Shirley Grounds. Once there, before a remembrance ceremony began, they walked the 400m oval with candles around the track as the hearse with his body followed, in a fitting send off to Samuels, a 400m runner, who ran 50.6 seconds in the event before turning to coaching at the tender age of 18, and spend the next 38 consecutive years developing athletes until his death on September 6, during Hurricane Irma. Samuels, who founded the Fast Lane Track Club in 2003, was remembered for his commitment and dedication to track and field—an unparalleled level of dedication and commitment—in the 47 year history of the BVI Athletics Association. Samuels was a multitasker and was instrumental in all phases of the sport besides coaching, in such areas as administration, setting competition calendars and meet schedules; setting up for competition; recruiting volunteers among other things he did for the development and enhancement of the sport. On competition day, he was the first on the track and the last to leave. This year was one of Samuels’ best years as a coach with four of his athletes making a significant inroad on the territory’s All Time Listing. Kyron McMaster who ran his first hurdle race in 2014 and has no more than 25 races to his credit, ended the season with the fastest 400m Hurdles time run in 2017, when he dropped 47.80 seconds over the barriers on May 20 in Jamaica and has three of the four fastest times run this year. His 47.80 second time places him at No. 28 ALL TIME in the history of the event on the IAAF list. McMaster also recorded a 200m personal best of 20.72 seconds, the No. 2 mark in the event on the BVI All Time List. Ronique Todman’s times of 21.22 and 47.42 seconds in the 200 and 400m saw him climbing to No. 4 in the 200m and No. 5 in the 400m among BVI athletes who have run the event All Time. Samuels understanding of coaching perhaps benefitted Shaquoy Stephens the most. Stephens, a student at Kansas State University, was not a part of the Wildcats track team and worked out on his own with Samuels’ workout. On May 6, he ran 10.36 seconds over the 100m, becoming the territory’s second All Time best sprinter. Since joining Samuels stable, in two years, Long and Triple Jumper Kala Penn has moved to No. 2 All Time in both horizontal events. She leapt 6.24m this year in the Long Jump and cracked the 13m barrier for the first time in her career in the Triple Jump, when she hopped, stepped and jumped 13.09m in July, a goal Samuels had set for her in 2016. Samuels worked with very BVI athlete that has attended the Olympic Games, 1996-2016. He also coached in the CAC Games, Pan Am Games and Commonwealth Games. He was the coach when the BVI participated in the inaugural IAAF World Jr. Championships in 1986. In 2016, he coached Kryon McMaster to an IAAF World Jr. Championships 400m Hurdles bronze medal—the territory’s first medal at World Jrs. He has also coached at the IAAF World Youth and Sr. Championships.